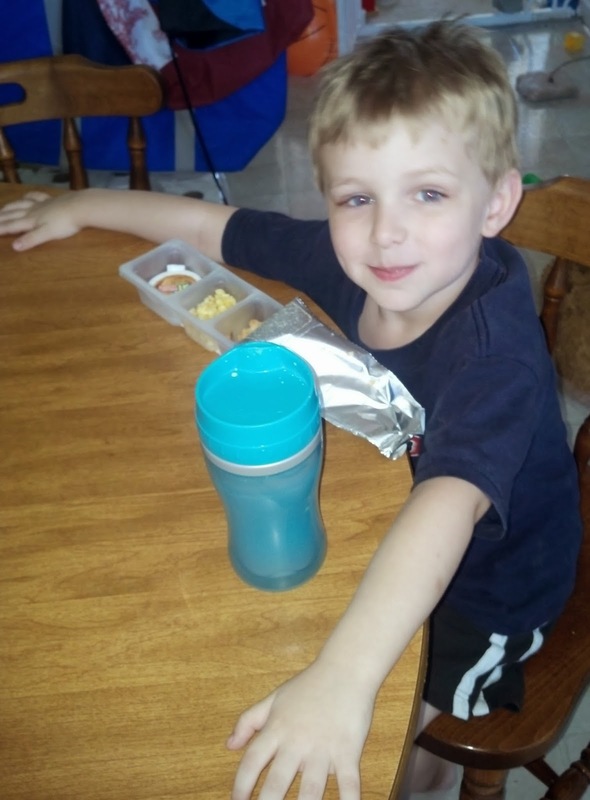 It's This or Murder...: Lunchables Jr.: Save the Pack, Wrap and Stash. I was chosen by Crowdtap to hold a Lunchables Jr. Playdate, and received the yummy snacks in exchange for my feedback. I'm sure we all know what Lunchables are. Lunchables Jr. are a treat for the younger set that has all the construction fun of regular Lunchables, with cute names like Teddy Bear Picnic, Ants on a Log, Blueberry Bonanza, and Very Beary Crunch. 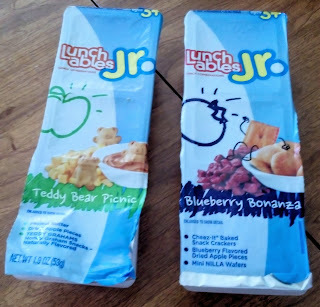 The two we tried out were Teddy Bear Picnic and Blueberry Bonanza. 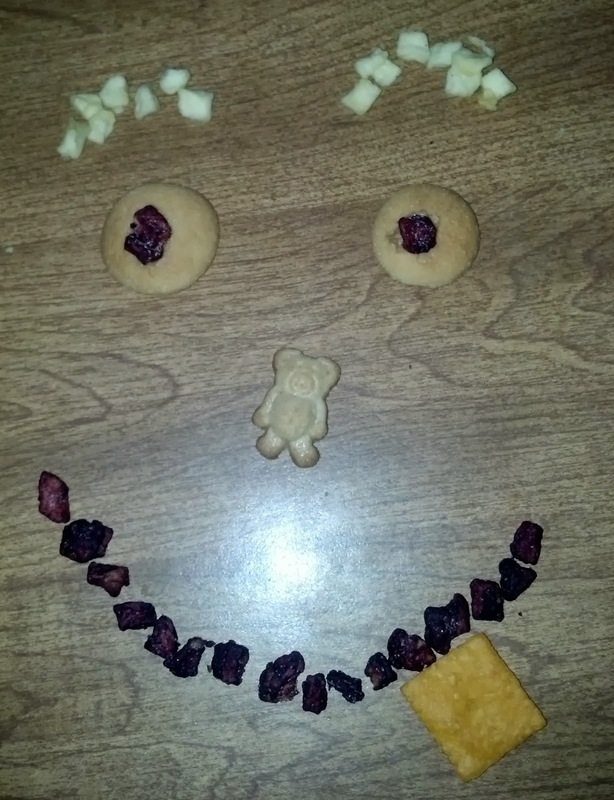 Teddy Bear Picnic has honey flavored Teddy Grahams snacks, dried apple pieces, and a little tub of peanut butter. Blueberry Bonanza has Cheez-Its crackers, blueberry flavored dried apple pieces, and mini Nilla Wafers. 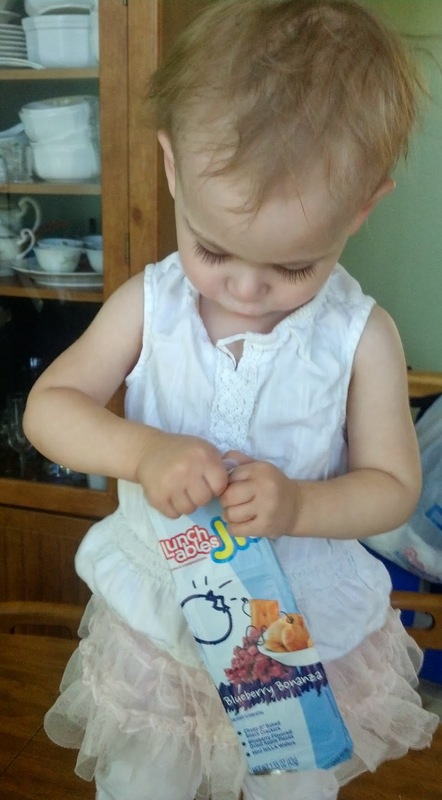 The packaging was very appealing to the little ones. I just held them out, and the kids snatched them up and pulled them open. There was a third guest, age 4, but I was asked not to put her image in my post. The first thing they did was start nibbling. 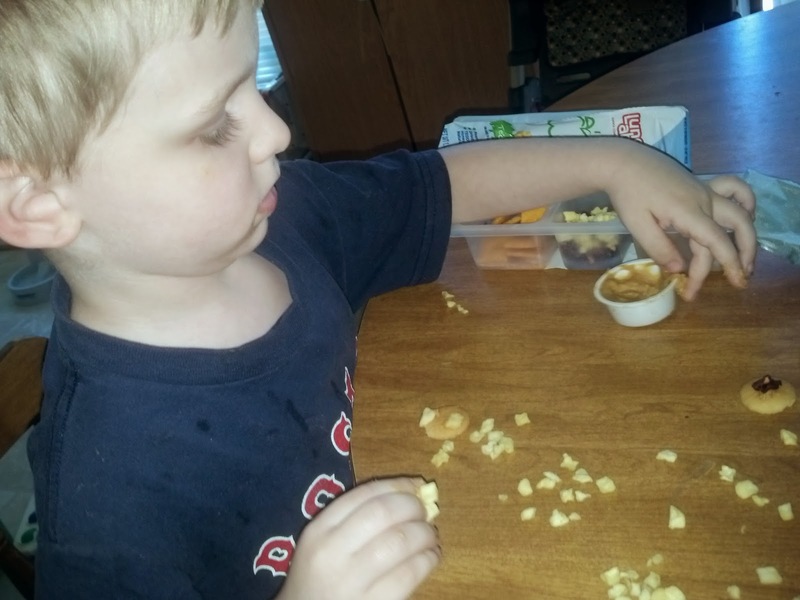 They got really excited, though, when I told them that for a change of pace, they could play with their food. The dried fruits and crunchy treats are ideal for artwork. My son took this prospect quite seriously. The Great Snack Caterpillar. He's holding a teddy bear. The kids insisted. 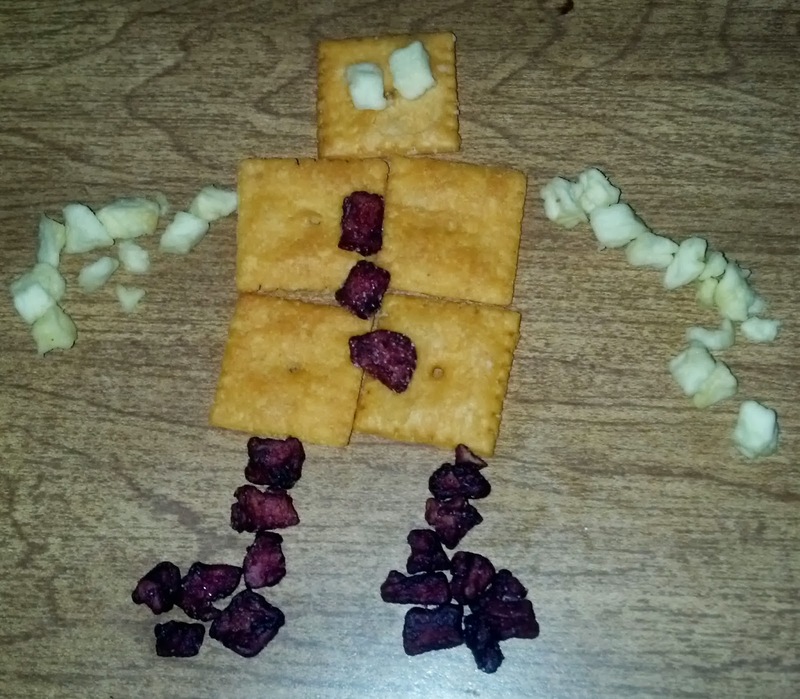 And last but not least..Snack Bot. They finally got hungry enough that the art was soon gobbled up. 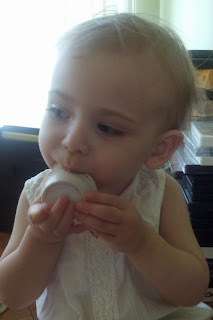 My daughter in particular enjoyed the peanut butter, much to the chagrin of the others. I polled the kids to get their feedback. 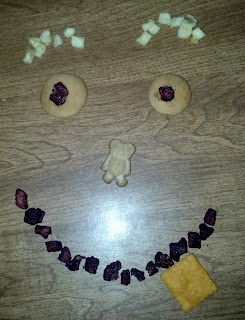 The consensus was that they loved the cookies and crackers, but the fruit wasn't a big hit. 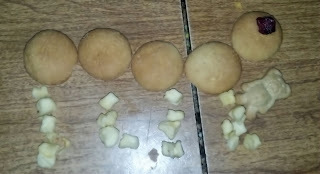 Between the two fruits, the blueberry flavored apple pieces were more popular. None of them ate very many of the regular dried apples...they said they were too soft and chewy. They really liked the little peanut butter dipping cup in the Teddy Bear Picnic. The thing they mentioned the most, oddly enough, was the package. They thought it was "fun" and liked the way it looked. My grownup opinion wasn't far off from theirs. I liked the packaging as well...the size and shape is very easy for little fingers to manage. The colors, too...very bright and sunny, perfect for that age group. The crackers and cookies were all classics, and very appealing to kids, and even me. I loved the blueberry flavored apple pieces, but agreed with the kids on the plain ones...while tasty and flavorful, the texture left a bit to be desired. The blueberry ones were a surprise to me, personally...I thought they were dried cranberries, not apples. Very cool. The best part is being able to just grab a healthy snack all ready to go without having to pack it up, wrap it and stash it for later. All three enjoyed Lunchables Jr. tremendously, and my son begged for more. I am curious to try the other two flavors, so they'll be on my next shopping list. I think they're a great option for both busy on the go moms and a fun treat anytime.